Listen for the sound of high-pressure gas escaping. Gas and flame detectors should be permanently installed in indoor storage facilities where leaks may occur or where hydrogen may accumulate. Listen and watch for alarms. Use a portable hydrogen detector. 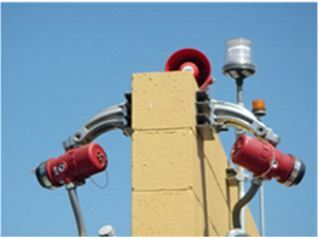 A portable flame detector (e.g., thermal imaging camera) should be used if possible. Otherwise, listen for venting hydrogen and watch for thermal waves that signal the presence of a flame.